Difficult conditions persisted on the River Moy for most of the week due to low water levels and bright sunny conditions. However, two nice fish were caught on the Moy Fishery. 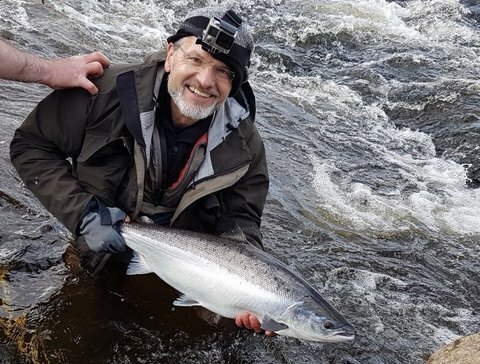 Daniel Konecny, Germany, had a ten pounder on fly on the Ridge Pool, while Brendan Garland, Northern Ireland, caught and released a fine double figure salmon on the Weir Pool. Brendan Garland, Northern Ireland, just about to release a fine spring salmon on the Moy Fishery. Elsewhere, Tim Demler, Canada, landed the first fly-caught fish (8.8 lbs.) on Mt. Falcon. On Cloongee, Przemek Grochowski had two salmon (one released) on bubble and fly. Flyangler, Pascal Nicolas from France had two salmon at 9 lbs. and 10 lbs. (both released) on the East Mayo water. Judd Ruane, skipper of the Pegasus, reported a good start to the season on the Moy Estuary with Jimmy Kane & friends from Longford landing 14 sea trout. However, the best fish of the week was a 4 lbs+ sea trout caught by Peter Jackson from the UK. Bright and sunny conditions with easterly winds prevailed for most of the week on Lough Arrow. While anglers were struggling during the day the evenings produced some fine brown trout. Amongst the successful anglers were Gerry Merrick with two fish at 1.5 lbs. & 2 lbs. and Ryan McGoldrick with a three pounder. Ken Murray & Gerry Kelly reported good fishing over the weekend landing several nice fish, best at 3.5 lbs. & 4 lbs. Lady angler, Sarah Maxwell was also successful catching 3 trout (2 released).